Darkness develops around an area near Kimberley, Oregon. 290 horses lie dead, mostly remains of bones now, underneath an extravagant pile of tree limbs (on Private Land and cameras guard this area from trespassers) brush, and branches. Apparent is the gruesome fact, via several witnesses and testimony, the horses shot within the past year. More apparent, is the line, literally a line of horse bones, shot on Public Lands as well, which “Ups” the shootings to in-excess of 350+ within the past year – all the way to Mt. Misery and on Public Lands as well. We also have found Poaching to be “widespread” in each area, with many deer remains as well as Elk and Bear. Bureau of Land Management contacted, several times, and state they have no HMA’s in those areas, so it could not be wild horses. Sadly, we also find the Prineville Area BLM Director being paid off by the Longview Ranch owner (attested by many — Corriente Cattle) – as many of the folks and towns people claim, as well as other witnesses to this fact. We also discover (within a confirmation process) cattle still being grazed on America’s Public Lands, illegally and contrary to BLM Grazing Permit Contracts, on several levels; which, show October 15, and yearly, is the date “all” cattle to be removed, off of Public and Federal Lands unless otherwise specified within Contract negotiation – This contract shows us no negotiation present nor extensions made available. The ranch foreman and his wife, both come to town and to this day “Brag” about shooting the horses, and how many horses they have shot over the past year. Another involved, an Oregon Department of Transportation employee, also “Brags” about shooting the horses, as if it is a “getting even method” of killing horses, and to hell with horse advocates and environmentalists. Witness after witnesses’ attests to their “shocking statements’, as the horse’s shot were part of a very favored horse herd, running on both Federal/Public Lands and private lands (which places them, despite the reputed blood lineage, within the WH&B Act of 1971 for protection), called the Puddin’ Foot Horse Herd. The community horrified, and simply feel unsafe with this situation developing in their own backyards so to speak. This horse herd was a joy for many people in this community to watch, and some would drive out near the areas (where they met their doom), to see them run, play, a pretense of a wild horse herd (the reality is they were of a mixed-blood lineage of several ranch horses and wild horses over the years — Ochecho for one and Steens for another, as everyone knew this as fact), but left unprotected on private lands. Many had names for every horse in the herd – kids and adults named them, while admiring their stature. (writer’s note: this is very difficult to write, indeed, due to how gruesome this is, as well as how insane this entire situation obviously has become). The shooting of the horse herd comes as a surprise when first hearing of it. Many are saddened over the obvious abuse and some assume under the guide of Federal Law Felonies – which, is another yet to be explored fact, but under many abuse laws, and in accord with Federal Law as well, these situations can be reviewed within Federal Court as well as submitted to the Federal Grand Jury also. Many concerns over Public Safety, assumptive from the participants of these shootings of horses, and so many, as defined as a very Blood-Thirsty set of events over the past months, as it happened every morning, as one shooter bragged to a few others in town. Trap and Bone Piles in area of: 44′ 43 minutes 45.5 North – 119′ 43minutes 18.6 West Found within a mile . . . I had asked the obvious question to an old Psychiatrist friend – Just how crazy is this, the shooters, and should this community be concerned? The authorities in both Wheeler County Sheriff’s Office as well as Grant County Sheriff’s Office have been called, but up to this point no response or call backs obtained. The same with the BLM Police – All the lands involved, private lands as well as BLM lands, are involved. The owner of the ranch, living in Reno, Nev., has not responded to any calls up to this point. Many of us have the coordinates (i.e. GPS) locations, as well as maps directly related to the massive bone piles and chains of horse bones around Mt. Misery and surrounding areas – the dead-horse count is increasing as days move forward, from aerial telemetry and photos. Many people are now getting more involved in this horrendous situation, and all of us concerned over just how many horses have been killed, both on private lands as well as Federal and Public Lands over there. Abuse run amok here, obviously. We will update you upon further circumstances, and will be discussing further, with law enforcement and Federal /authorities again and this coming week — as Our Attorney tells us. Someone needs to wear a wire and record the bragging. This deserves prosecution and harsh sentences. Wild horses belong to the people and these killers and those who protect them should be shut down permanently! How Can This Be Happening, They Are Publicly Bragging About This, And Nothing Is Being Done!!! They Should ‘NOT’ Be Anywhere Near These Horses Or Their Areas, They Also Need To Pay For This Awful Unfair Crime To These Poor Innocent Horses!!! THIS IS TERRIFYING AND TRAGIC,!! WTH , this is how we protect the wild Horses? This is how we treat them? Why? Just because BLM or cattlemen, our gov. wants to tell the public wild horses are overpopulated, or not enough water or food for them to eat, the public believes it.Well I will never believed it .Because if that was true I know they would be seen on all public land.The wild horses are needed on the public land, they work together with other species to keep wild fires under controlled. Go get em, I believe you have the support of many. I should hope someone contact s the states attorney’s office. Got a feeling this is going to be a shake down. To much greed and corruption.These horses being slaughtered is like the times before when they slaughtered the Bison. Greed. 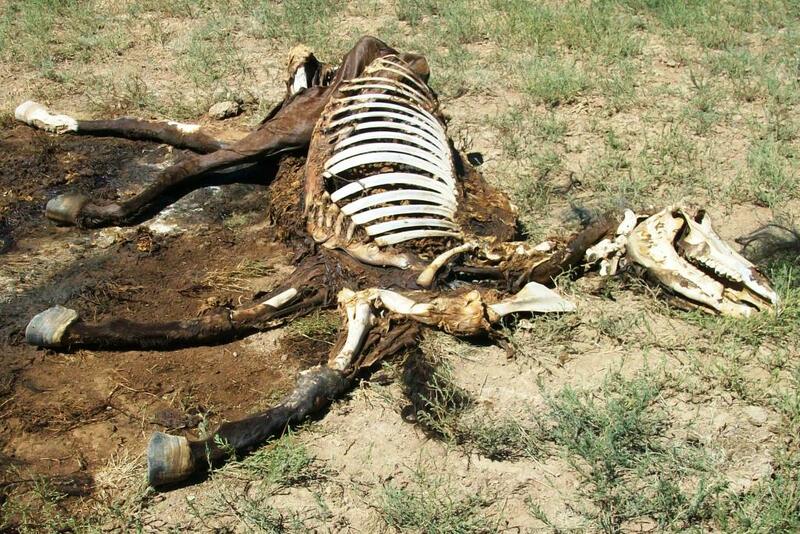 Innocent and beautiful horses are dying for NO VALID REASON!. ITS PURE PSYCHO PATHIC! IT MUST STOP! This is utterly despicable and there should be an immediate and thorough investigation and those responsible for this should be severely punished! What devils! This is horrific and we need to bring these people to justice. Please proceed as this killing with a mentally unstable person can escalate to the killing of people too. BLM didn’t notice for over 1 year?? These killers need to be prosecute)))d and fined for every horse that they killed!!! Better yet lock then up for the rest of their lives! People like them don’t need to be living in our society they are dangerous!!! The 1971 Act is supposed to protect the horses from people like this. Look how far we haven’t come in all of these years, corruption still rules the land. And imagine if the shooter’s cattle were shot dead in the same manner. Imagine the uproar, the investigations, the hypocrisy. I honestly don’t understand the mental state someone is in to shoot a horse, A HORSE. No one in their right mind. Horses should be America’s national animal for all its done for man and this country. We have an admin. that is an animal hater, his sons do trophy hunting, to date we still do not have a BLM director, Mr. Trump has many positions to fill. He wants the wild horses gone, look how they killed Mrs. Pickens horses, they wanted them to suffer the way they were shot. FIRE EVERY BLM EMPLOYEE, they have killed murdered wild horses since the day of the protection in 1971 . cut the budget by cutting a few useless blm wranglers . DOJ needs to step up here. Get the BLM to stoå that mass killing. They have NO right to do it for one or few ranchers. It has to stop.BLM is not the king either are the ranchers. Nobody is over the law. I am so mad if people did not care the world would be worst. You sobs will be found out killing horses,elk,deer,etc. What goes around will come back to you. This is just horrible! Why are our wild horses under attack fe all sides? They are beautiful and free and have harmed no one. I’m getting really sick of our government not doing a thing about this wild horse feud! And it keeps getting worse and worse. We should BURY the White House with letters to Trump to do something. And we need to start protesting. Why are there never any protests about this situation? I’d go if there was one in Portland! This is horrible waste of life. A national treasure destroyed for grazing rights for cattle? I hope they’re prosecuted to fullest extent of the law.